The Brain Project – a joint public art initiative and awareness campaign in support of Baycrest Health Services — will raise awareness and donations toward one of the most important issues affecting our aging population: brain health. If the yellow brick road in the Land of Oz led to Toronto, The Scarecrow, ever in search of a brain, could have saved himself a lot of trouble. Instead of dealing with flying monkeys and a Wicked Witch, the straw man could have strolled down any of Toronto’s not-so-yellow-brick-roads and come upon a brain in plain sight. And we aren’t talking just any old bits of grey matter. We mean 100 top of the line noodles designed by artists and celebrities from around the world, all unique and original, that will be gracing Toronto streets, with “cluster locations at Nathan Phillips Square, the Distillery District and Union Station, and 50 individual locations around the city.” And best of all, they’re popping up for a good cause. This past weekend marked the launch of The Brain Project – a joint public art initiative and awareness campaign in support of Baycrest Health Services to raise awareness and donations toward one of the most important issues affecting our aging population: brain health. 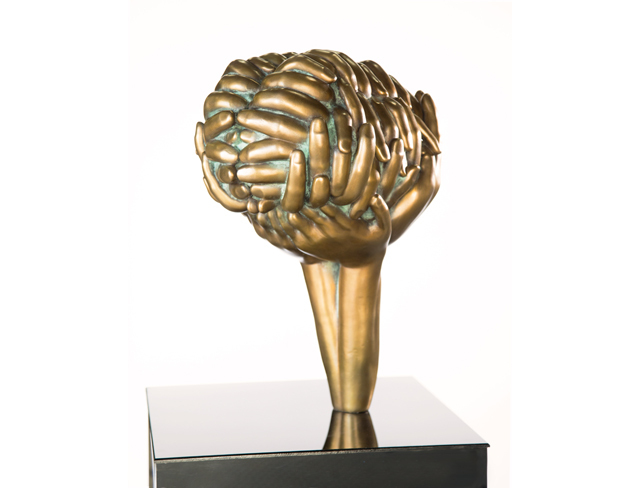 Visit www.brainproject.ca to learn how you can donate to Baycrest and click through our slideshow to learn more about some of the brain sculptures, and the artists, that will be on display around Toronto this summer. Title: And With a Glimmer, It Falls Apart. 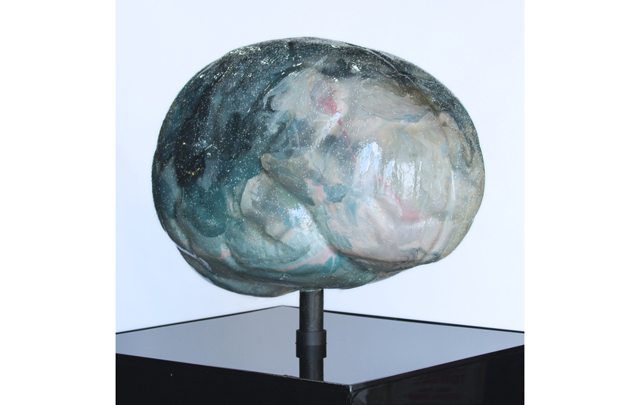 ‘And With A Glimmer, It Falls Apart,’ is a painted, abstract re-mapping of the human brain that communicates the biological processes of neural deterioration and the concept of memory. The agglutinations of thick paint trapped underneath the epoxy resin are incredibly volatile and will crack over time. This subtle transformation is meant to mimic the brain’s eventual loss of plasticity, the formation of neural plaque and the development of conditions such as Alzheimer’s disease, as a gesture of both sympathy and solidarity. Phosphorescent particles suspended in the resin cause a faint nightly glow as a metaphor for the existence and phenomena of memory. 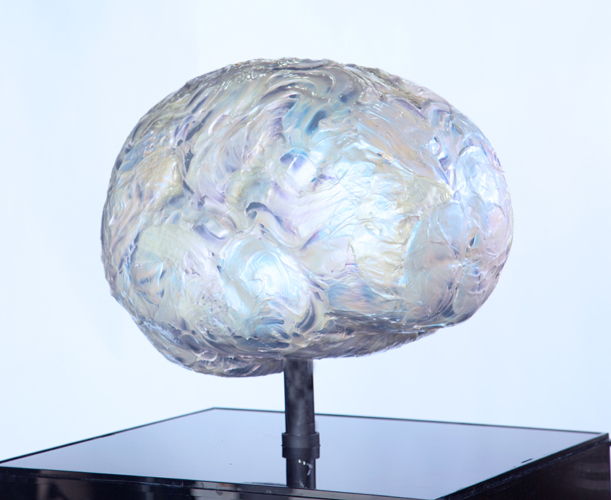 This Brain Project sculpture is dedicated in loving memory to Jordan Clayton’s grandmother, Shirley Sellon, the shining light behind this design. Title: How is Life Under the Tree of Knowledge? The brain is our treasured Tree of Life, generating our astounding science, art, security and sense of human rights. The demands of work often reduce our opportunities to enjoy the splendours of life. We can become technocratic, even robotic – yet we all are born human. Our poetic life is intruded upon by our cold rationality. Only the child, the ladder and the milk bottle are shown as unaffected. We harm our planet with waste. Our access to the realm of art is not easy, the ladder is too short. The snake belongs to our narrative. Excessive concern for material things can often lead us astray and diminish our individuality. 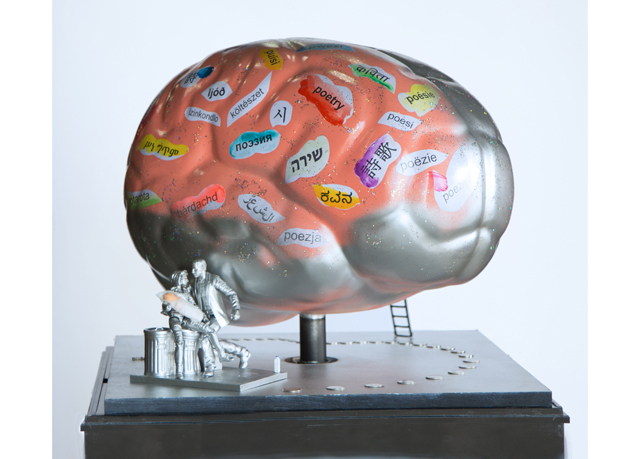 This sculpture honours the many anonymous people lending their support to help find a cure for Alzheimer’s disease. Artist Harold Feist has applied a thick, translucent skin of acrylic paint made up of folds and layers of varying colour which flow over and through one another. The paint is made of varying thicknesses of titanium coatings on suspended mica particles, which produce hues and shades that change depending on the angle of view and the quality of light. Feist said this shifting behaviour of colour is analogous to the neoplastic nature of the brain’s ever changing, interconnected structure. 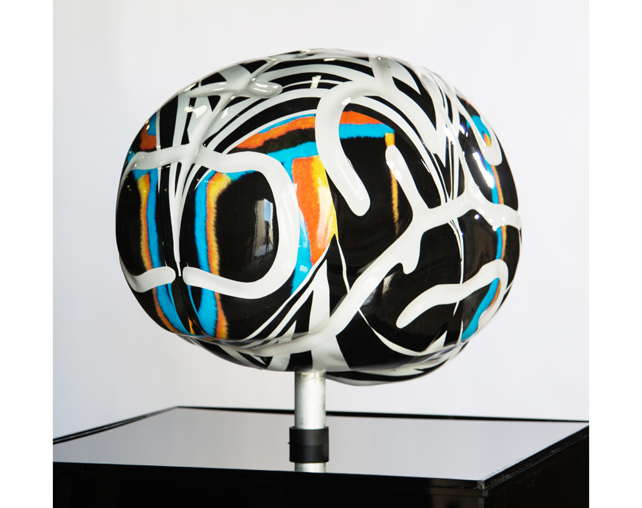 Gina Godfrey was inspired by one of her recent abstract works called Eyecatcher. This adaptation is primarily in the same colours – black and white with streaks of orange, yellow and blue to represent brain impulses. 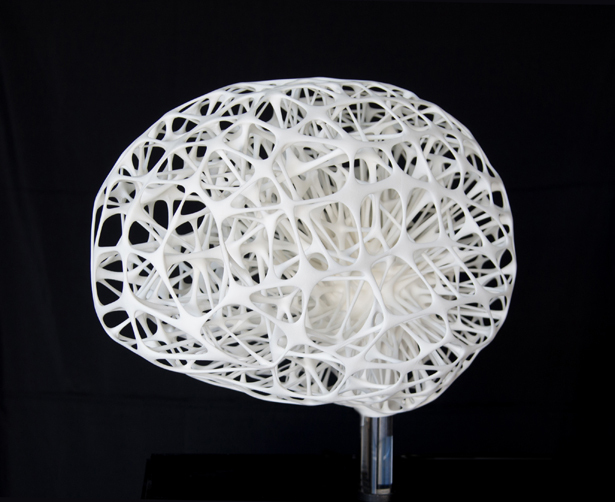 The frontal lobes that look like large bug eyes are associated with executive functions such as self-control, planning, reasoning and abstract thought, which the artist thought would be fitting references in a brain sculpture. Because she finds symmetry to be a pleasing effect, the left hemisphere is a replication of the right. Electrically Excitable explores 3D printing in combination with a digital sculpture to go beyond the practical impossibilities of prior sculptural techniques. Parvez Taj’s goal was to recreate the neural networks that transmits information through electric and chemical signals.